If you are using the coin acceptor's interrupt outputs, try checking out our tutorial on processor interrupts with Arduino to get an idea of how to use hardware interrupts. The demo video did not use Arduino code. Nick just connected a USB-to-serial converter to a 6-coin acceptor (calibrated with different samples for the coin denominations). By opening a serial terminal connected to the COM port (with the setting 9600 baud, 8-none-1-none), Nick was able to view the output when a coin was recognized. Note: -(NC)- means that there is nothing connected. For more information on serial UARTs, I recommend looking at this tutorial => https://learn.sparkfun.com/tutorials/serial-communication#uarts . I also recommend looking at the Arduino Serial Library [ https://www.arduino.cc/en/Reference/Serial ]. Looking at the datasheet, the serial signal output (Rx) and the counter output is 5V. If you are using this with a 3.3V system (Raspberry Pi or BBB), a logic level converter or resistors for voltage division is required. Granted I didn't look at the datasheet, but I find it hard to understand how it uses "fall time" to determine what coin it is. Doesn't physics tell us that all coins should take the same amount of time to fall a particular distance? That feature prevents people from using currency that doesn't abide by the laws of our universe. Aliens are notorious counterfeiters. I had to log in just to upvote and tell you how awesome your comment was. If I remember correctly, when theyâre talking about âfall timeâ theyâre talking about how >long a coin takes to make a weighted arm fall. Example: Take a lever with a center positioned fulcrum. Put a 1 kilo weight on one side. >Now, on the other side put differing weights. A 2 kilo weight will fall slower than a 10 >kilo weight, as it sits on the lever. But that's still the same physical scenario -- the 2 and 10 kilo weights would fall at the same rates. Both in the case of just gravity and this counter-weight arm, you have a constant net force affecting your different coins. Since the acceleration and the initial velocities of all the coins will always be the same, their fall times will be as well. So no, that can't be right either. These are not mechanical anymore with levers and counterweights. They rely on Â« travel time Â» through a Â« gate Â». Metal object falling through a magnetic gate will produce Eddy's current and slow down at varying speed. All of y'all are wrong, it does use a magnet if I'm correct, but it uses a feature of physics known as eddy currents. As any conductor moves in the presence of a magnetic field a current is generated in the conductor. Depending on several factors such as the size and conductivity of the object, such as a coin, it will fall at different rates. It falls slower because some of the gravitational potential energy is utilized to move the electrons. Hope this helps! I think you are right in that everyone is wrong including you and probably me. I think it uses a very sophisticated facial recognition. Every coin has a face and then it can tell whose face it is looking at and thus tell what coin it is. Plus this takes care of the counterfeit problem because not all countries have the same faces on their coins and it would be hard to make the same funny face unless you are very skilled. Mainly so people don't use the quarter-on-a-string trick. I don't know if the following applies to this particular device, but it's common on coin acceptors to have the coin fall past a magnet. A "slug" will stick to the magnet, and stay there until the "eject" button is pressed, which then allows the slug to fall through the return slot. Non ferrous coins are affected to a much lesser, but still significant degree as the go past the magnet. The magnet slows them down enough to change the fall time. So, in effect, the magnet tests the coin for metallic content. Just purchased one of these and have discovered that it will not accept Australian 50c coins. They are 31.5mm. Just 1 mm off, but it won't go in at all. Hi, do you have another link? That one appears to be broken? Also would you be able to write me some code for this to do a keystroke upon the correct amount being entered? (for payment of course). I have updated my post to fix the link. I might be able to write some code to convert serial inputs into keyboard events, depending on your platform. Email jason at <my username> dot net with more details. Please note that this coin slot is not compatible with Australian 50 cent coins. Perhaps all that is needed is some slight modifications to the front coin slot. I will give it a go later. We have this coin acceptor hooked up to a turnstile. 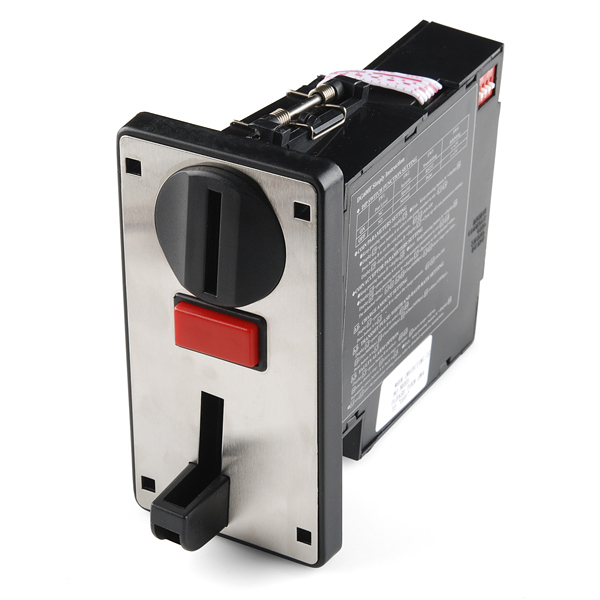 Turnstile 'ready' relay switches inhibit pin to ground. So as long as turnstile is busy with previous customer new coins are returned. After a while inhibit just stops working. I have now 3 units that no longer react to inhibit. Can these be repaired? What could be causing this behavior? Does this accept square coins? Guys anyone knows how to fix the E7 ERROR (i.e either key A or B is stuck) ?? I'm interested in this one, anyone have a quick links for this coin acceptor to send coin value to c# or vb.net? I can confirm that this works with a mixture of US and Japanese Yen! I have a modified "Hater-Matic" at my clinic in Japan giving out jokes to patients! The one that I got had markings on a paper label saying "CURR. :USD". This made me think it might be pre-programmed for U.S. coins, so before going ahead and tinkering with the programming, I grabbed up a bunch of coins and tried it. Before even connecting it, I dropped several coins through. Pennies, nickels, dimes, quarters, and dollar coins dropped out into the "reject" slot. I even happened across a 500 Yen coin (about the same size as a dollar), and it also dropped out into the "reject" slot. However, when I tried half dollar coins, they got "stuck", and even pressing the "jam" button didn't help. I managed to get a glimpse in, and discovered that the half dollars get "stuck" on a screw post that has an unfortunate position. Powering it up, I found that it rejected pennies entirely. When a nickel was put in the slot, it would fall "into the bucket" and the display would read "01". A dime would also be accepted, and would read "02". A quarter is accepted and gets an "05" on the display. THE HALF DOLLAR STILL GETS STUCK! It does not accepted. I was able to get them back out, but doing so generated error messages on the display. A one dollar coin is accepted and generates a "20" on the display. I'm planning on re-programming it (I want it to accept pennies, and would rather have the "result code" be in cents than in nickels). I'll probably just put a sign on it saying "NO HALF DOLLAR COINS!" I think that there'd be room for the halfs to be accepted, but if rejected, they'll jam, and it's gonna be tough to get it to "program" them. Oh, just for the record, it did reject the 500 Yen coin. Damned poor planning on the part of the manufacturer here, IMHO. 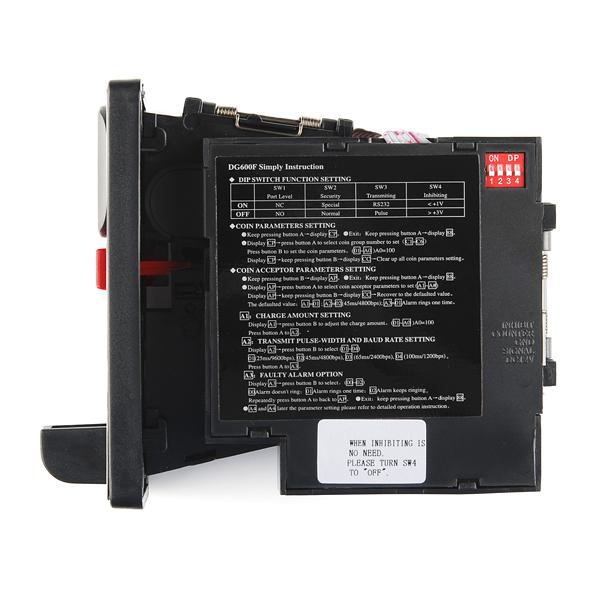 The datasheet gives a maximum of 30.5mm. The United States Mint gives a size of 30.61mm for the half dollar. ARGH! And the slot at the front is a LOT wider than that! 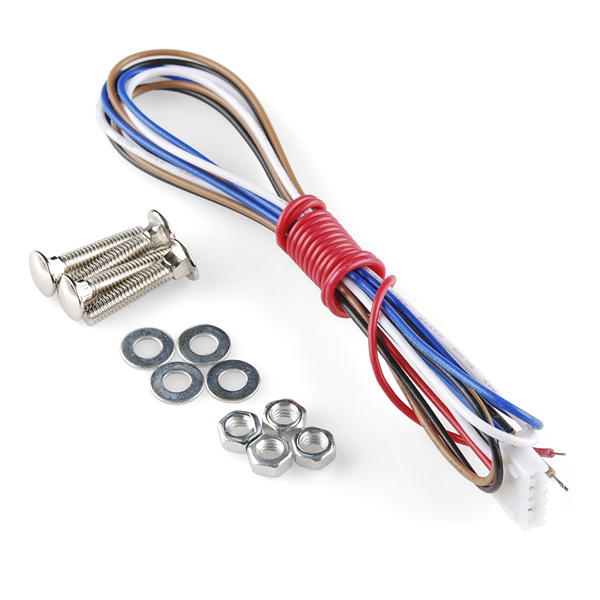 Somebody knows the part number (or family) of the header 5 pin connector? I have not been able to identify it. Thank you! The penny is perhaps the most debatable coin in circulation, as it costs more than one cent to make one and nobody likes the things. A sports shop is so fed up with them that the store owner has declared pennies prohibited from the premises. Source of article: visit at present your websites. Hi guys. 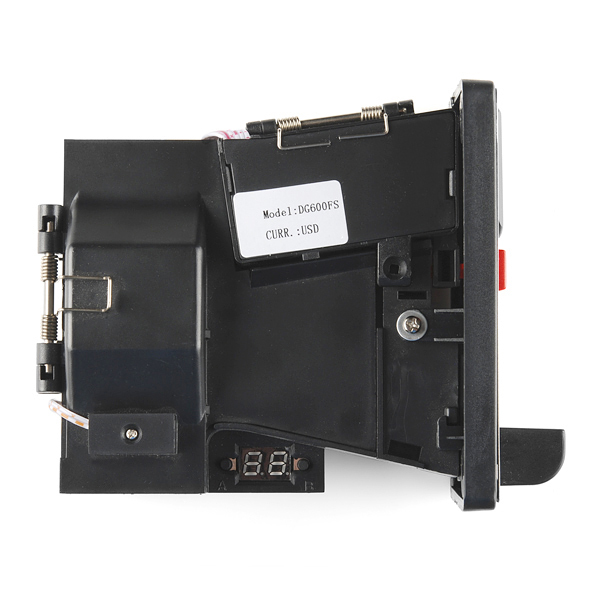 Is it possible to get a 3D CAD model (solid works) for this coin acceptor. I would like to incorporate this product into ours. Does it accept coins with holes in the middle? (Norwegian 1 kroner and 5 kroner) I know other types does NOT accept coins with holes. I recived mine today, programmed it for norwegian coins, works for NOK 1 (Hole), NOK 5 (Hole), NOK 10 and NOK 20 coins. Looking at the vid it was easy to program it, put each coins thru for about 20 times then it was accepted. Trying to connect to pc via rs232 RX channel and view in Real Term, but only shows a ho lotta bunches of pulses as Hex or integers. tried setting switch 1 to on and 3 to on but no luck, so any one know how to wire it up? 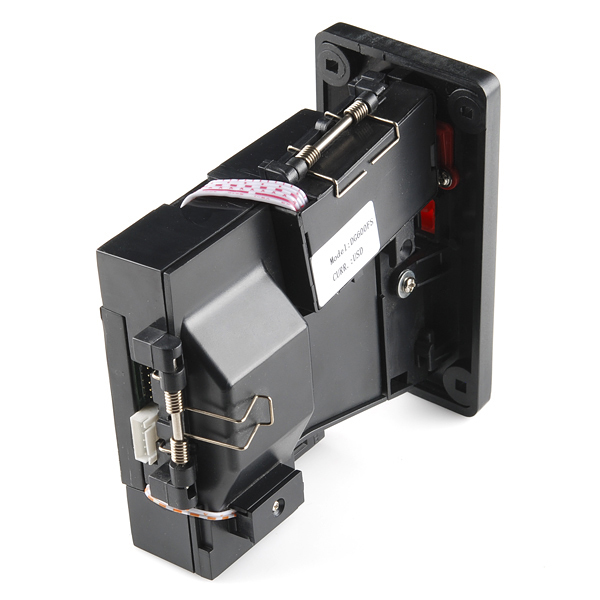 How does this acceptor communicate with MAME? Years ago, I built a coin box that would turn on a 110V outlet for a set interval. Nothing adds hilarity to a household appliance like your quarter running out at an awkward moment. will this work attached to the top of a box with the inards pointing down? Nope, not at all. The spec is vertical installation plus/minus 2 degrees. Coins with different moments of inertia roll down a ramp at different rates. Moment of inertia contains information about mass and shape. If I remember correctly, when they're talking about "fall time" they're talking about how long a coin takes to make a weighted arm fall. Example: Take a lever with a center positioned fulcrum. Put a 1 kilo weight on one side. Now, on the other side put differing weights. A 2 kilo weight will fall slower than a 10 kilo weight, as it sits on the lever. I bought 2 coin acceptors. They do everything I wanted and they look great. I connected both of mine to an Arduino Micro and that is connected to my arcade machine PC. one of the units had a malfunction. immediately after contacting sparkfun, they helped me with it. one of the best customer services I ever got! I purchased 2 coin acceptors for use in my Pure Water vending machine. They were much easier to program then the ones I removed. I simple told it the value of each coin then sampled them thru the coin acceptor to teach them the weight and size of each coin. I was up an running in no time. The rejection rate is very low only had a problem with really new coins that were not in circulation so the weight was a tad heavier, all the other coins it accepts fine. I Would recommend them for your next project. After 2 weeks stopped working. Sorry you're having trouble with the coin acceptor. I'd suggest sending an email to our tech support team [ techsupport@sparkfun.com ], and they should be able to help resolve your issue.